These chocolate coffee desserts are not only a tasty treat, they are also a show stopping finale to your already amazing dinner party! 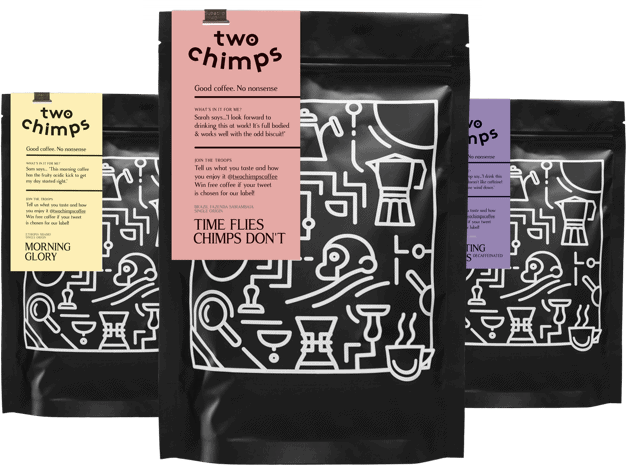 What could be better than a sweet treat followed by an amazing cup of freshly brewed Two Chimps Coffee at the end of a dinner party? Here you will find our step by step guide showing you how to make the ultimate chocolate coffee dessert. The beauty of these desserts is that they can be made the day before and finished just before your guests arrive. 200g Dark Chocolate, 100ml of strong brewed coffee, 4-6 tbsp of coffee liqueur and 250ml of double cream. You can get really fancy by using a little extra cream whipped with sugar to decorate and even a few chocolate covered coffee beans to really show off! Wash your paws and pop your fashionable and practical, apron on. 1. Pour your cream into a saucepan and bring to the boil. 3. Once the cream has boiled, add the chocolate to your cream along with the coffee and liqueur. 4. Keep on a low heat until all of the chocolate has melted. 5. Now your mixture is smooth, divide into 6 espresso cups, small glasses or one big bowl for yourself! Pop in the fridge whilst you sleep and dream of becoming a millionaire and saving the world. Before your guests arrive, you can decorate the tops of your chocolate coffee desserts by whipping a little sugar and cream together to create a cappuccino-like topping. You can even add chocolate covered coffee beans- or anything else that takes your fancy. Once dessert is finished, and whilst your guests are commenting on how awesome your dessert was, brew some coffee in a Chemex, Filter or Cafetiere. Then pour their coffee into the empty (but still chocolatey) espresso cups for an after-dinner coffee with a twist. Ohhhh yeah – You rule! After your guests have left – do a happy dance and congratulate yourself on how awesome you are…High Five! If you would like to learn more about making great coffee, check out our brew guides for making coffee.